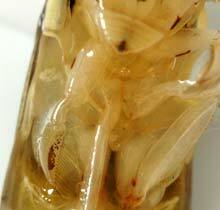 The chest (thorax) is the engine room of the Lesser Water Boatman. This is "thrust centre": swimming, flying and crawling. The chest itself is built mainly from the fly-muscles . The top shield of a thorax segment is called notum, and so we speak of a pronotum, mesanotum and a metanotum. The pronotum of the Lesser Water Boatman is relatively large, visible on the picture on the right as the rounded triangular part behind the head. It has a striped pattern on most species. The pronotum lies close against the front wings and as a result the mesanotum is hidden, except on the small Micronectae, who have the mesanotum visible as a triangular little shield (scutellum) This shield is very obvious as a dark coloured triangle on the back swimmer, and is a good help in distinguishing the back swimmer from the Lesser Water Boatman. EARS The breathing tubes (trachea) have openings(stigmata) on the body. Most of these are sited on the abdomen, but there are some on the thorax, two on each side. On our Lesser Water Boatman these are very peculiar: here are the creature's ears. The picture on the left is a sketch of the exterior of this tympanal organ, named after the membrane it features which lies as a drumhead (tympanum) over the hollow organ. It is still not clear how it works, the strange club on the drawing might cause a narrow band sound-resonance I presume. A nerve cluster (ganglion) is present under the membrane. There has been much investigation in the working of this organ, and research is still going on. It appears the bubble of breathing air surrounding the Lesser Water Boatman has a resonance frequency, which varies with the bubble size and the water temperature. Just after the bug has reloaded his fresh air supply at the surface the bubble is at it's largest and the frequency (and thus the tone) at it's lowest. When he chirps, the pitch is also somewhat lower. The bubble is gradually getting smaller as the air is used up (the real physics behind that are too complicated to be dealt with here), and the frequency goes up. Quite logical if you think of the pitch of large and small drums. For Corixa species the frequency varies this way in a band form 1.5 to 2.5 kHz and that's where the resonance-frequency of their ears lies too. Then there is the effect of the water-temperature: the resonance-frequency of the bubble lowers in a linear slope as the temperature gets higher, investigators found for example with Corixa species a lowering of 2.4 kHz at 4°C to a 1.95 kHz at 16°C. This remains in the band of the central frequency. Finally, many species appear to have asymmetrical hearing, so one side is more sensitive than the other. Probably the direction sensitivity for sound is better because of this. The chirping sound of a Lesser Water Boatman is to be found on the page on the life of the Lesser Water Boatman. Next page: the front legs.